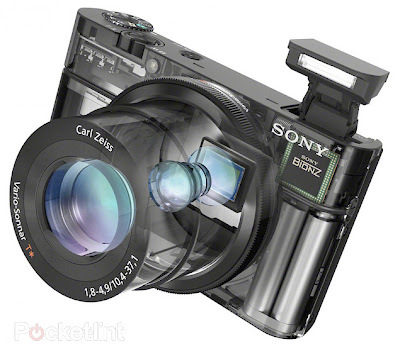 Sony has manifest the Cyber-shot RX100 with a larger than usual 1.0-inch sensor which measures 13.2 x 8.8mm.The 20.2 effective megapixel CMOS sensor in the RX100 is the same size as the one in the Nikon 1 interchangeable lens system and around four times larger than the 1/2.3 type used in many point-and-shoot cameras. This means it can capture photos with considerably more detail with low-light and produce images with low noise. The sony RX100 also looks to feature in capturing video, as the camera takes 1080p video at a smooth 60 frames per second and also containts the essentials for manual-minded shooters, such as RAW and RAW +JPEG shooting and peaking relieve for manual focus and the RX100 has many of the automated in-camera modes.The camera has a pop-up flash, a sturdy-feeling aluminum body, and a sharp 3-inch LCD screen with 1.2 million dots of resolution.the RX100's newly designed battery is rated for 330 shots per charge. The new RX100 camera features high-resolution 3-inch 1,229k dot Xtra Fine LCD display .It includes the option for six different creative styles and a variety of popular picture effects including Toy Camera, Partial Color, HDR Painting.The camera also uses the optimized BIONZ image processor and can shoot JPEG, RAW, or both at once. This camera is ideal for travel, portraits or street photography, delivering impressive results in a variety of lighting conditions with an intuitive, customizable control interface.